To read a brief history of the Fort Point District, click here. The 2011 construction of Fort Point Pier ("P&G Gillette Public Dock," as originally permitted, now owned and maintained by General Electric) is notable historically, marking two centuries since the 1807 demarcation of South Boston's seawall to form the "Channel." Also noteworthy, Fort Point Pier represents one of a number of exceptional area amenities conceived during two highly collaborative, parallel public projects. One project was the construction of the Central Artery / Third Harbor Tunnel (CA/T or more familiarly known as "Big Dig"). The second project, hosted by the Boston Redevelopment Authority, was the drafting of a conceptual plan for activation of the Fort Point Channel. Both of these processes converged through the enforcement of Massachusetts waterways regulations governing public access on Boston's tidelands, regulated by the Massachusetts Department of Environmental Protection (MassDEP). 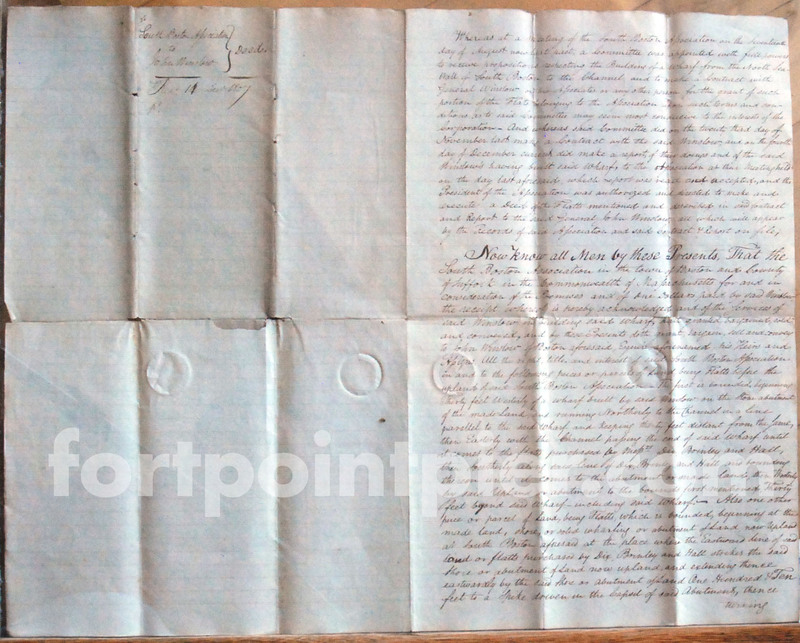 In 1807, the South Boston Association executed a "Deed of the Flatts" to convey rights to a General John Winslow. According to the deed, Winslow had completed construction of a wharf from "the North seawall of South Boston to the Channel." Upon completion of this wharf, Winslow was deeded rights to the flats not already occupied by the wharfs of a "Dix, Brimly and Hall." This deed conveyed to Winslow the rights to flats "until it comes to the main or principal Channel between said South Boston and the old part of said Boston." These rights were later conveyed to the Boston Wharf Company (est. 1836), upon which and by whom the seawall, made land and wharf buildings were constructed from the mid-19th century through the early decades of the 20th century. 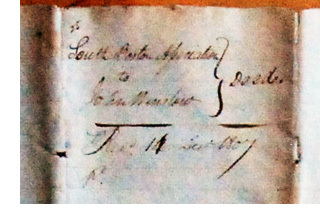 Editor's note: The original December, 1807 deed shown above (click cropped image to view) is in our possession, signed by John Mason, President of the South Boston Association; John Gardner, Jus. ; and B. Wm. Aline, Reg. of Deeds, Suffolk. The Boston Wharf Company and its managers were admirable stewards of the seawall, made land and over sixty acres of wharf buildings, for over 150 years. BWCo. 's investment in quality design and architecture survived to achieve local and national recognition. History of BWCo. 's development of the wharf district, later named the Fort Point District, was documented (by this author) for submission along with the official petition to the Boston Landmarks Commission for the local landmark designation of Fort Point as a landmark district. With the construction of wharf buildings through the late 19th century and early 20th century, BWCo. photographers recorded accurate records of each structure. An important collection of BWCo. 's original glass plates were donated to the Boston Public Library, available for viewing online and in person upon request. Wooden structures occupied a few of the Boston Wharf Company parcels immediately abutting the seawall at Fort Point Pier. Only one notable example of these wooden structures survived into the late 20th century: the renowned nightclub The Channel, which incorporated remnant portions of the wharf buildings along with its own modest additions/renovations. To read a brief history of the historic Fort Point District, click here. By the latter part of the 20th century, the Fort Point seawall had severely deteriorated. In 1990, the City of Boston's Fort Point Waterfront / Harborpark District Plan raised anew the potential of the Fort Point district and activation of the Fort Point Channel for public use. For the next 15 years, a succession of development and public realm master plans were published and/or enacted, each of which maintained focus on recognition, restoration and development of Fort Point and the Fort Point Channel. Of these, significant plans included the South Boston Seaport Public Realm Plan (2000), Fort Point Channel Watersheet Activation Plan (2002), Fort Point District Municipal Harbor Plan (2003) and Fort Point 100 Acres Plan (2006). For approximately five years beginning in the late 1990's, land abutting the Fort Point seawall at the location of Fort Point Pier served as laydown for completion of Boston's vast Central Artery/Tunnel Project. Only twenty-five yards from the location of Fort Point Pier — today an unremarkable surface parking lot — the seawall and land were temporarily excavated to serve as one of the true engineering marvels of the entire CA/T Project. The basin created by this excavation, 1000 feet long, 60 feet deep and 300 feet wide, extended from the Fort Point Channel to A Street. A cofferdam sealed the casting basin from the Fort Point Channel. While the basin was dry, 600-foot long concrete tunnel sections were cast on its floor, capped at each respective end to form a temporary seal. When the cofferdam was opened, the casting basin was flooded with water, and the seawater of the Fort Point Channel abutted A Street during this period. With the casting basin flooded, the first four concrete tunnel sections were floated and laser-guided into the Channel, then submerged onto an extensive support system of 110 drilled concrete pile shafts to keep this section of interstate tunnel safely crossing over the MBTA Red Line subway. The cofferdam was then closed, the casting basin water was pumped out and the entire casting process repeated for the last two tube sections. Today, the submerged, interconnected tunnel sections provide multi-lane vehicular access on the Massachusetts Turnpike (I-90) from downtown Boston under the Fort Point Channel to the South Boston Waterfront, leading beyond to the Ted Williams Tunnel and Logan Airport. In 2000, during the period in which the land at Fort Point Pier was used as laydown for the casting basin, the Boston Wharf Company sold the parcel (approx. 10 acres) to The Gillette Company (now P&G/Gillette). Through a series of monthly public meetings in the late 1990's through the latter months of 2003, the CA/T Project team worked with property owners, stakeholders and the Fort Point community to define precise commitments to surface restoration at the casting basin and also projects to mitigate impacts of the tunnel project that had bisected the Fort Point district. As a result of the CA/T Project's public process to identify and review surface restoration commitments (identified as the "CO9D2" contract), a number of Fort Point parks and public amenities became CA/T Project mitigation commitments. Among these public amenities considered and reviewed in CA/T Project meetings, was a touch-and-go dock at the casting basin site. In 2002, the Boston Redevelopment Authority published its Fort Point Channel Watersheet Activation Plan (FPC-WAP), an awakening of dormant water-dependent amenities conceptualized in its 1990 Fort Point Waterfront / Harborpark District Plan. The FPC-WAP, itself drafted over a public process from 2001-2002, conceptualized new paths towards activating the Fort Point Channel, including public access, art and other water-based amenities. The FPC-WAP specifically referenced some of the CA/T Project's obligations along the Fort Point Channel including the Harborwalk component of the CA/T Project's C09D2 surface restoration obligations at the casting basin site. The FPC-WAP also conceptualized a series of floating docks throughout the Fort Point Channel. Although the BRA's Watersheet Activation Plan was not a legal zoning or contractual plan, by serving as a catalog of potential ideas for activating the Fort Point Channel it raised public awareness and reinforced support for a dock at the site of the casting basin. From December 2002 through 2003, the Boston Redevelopment Authority convened meetings with Fort Point Channel stakeholders and advocates in the drafting of its Fort Point Downtown Boston Municipal Harbor Plan. Meeting notes recorded during this period are helpful in recounting discussions regarding the BRA's vision regarding location(s) and use(s) of docks and piers in the Fort Point Channel. As with the FPC-WAP, the Municipal Harbor Plan did not specifically reference the dock being discussed as part of the CA/T Project surface restoration at the casting basin site, but the Downtown MHP again raised awareness and provided conceptual support for public docks at various points along the Channel. 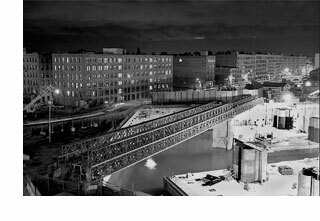 In 1992, the CA/T Project had sought and was granted legislative relief from state Harbor Line provisions in several portions of the Fort Point Channel to enable construction to move forward. In granting these project exemptions, the legislature authorized the Massachusetts Department of Environmental Protection (MassDEP) to review projects for compliance with the provisions of Massachusetts Waterways Regulations, ensuring appropriate review of proposed actions in terms of potential impacts on navigation and other important considerations. And state regulations were disposed favorably toward public access, watersheet activation and civic uses at the water's edge. Upon restoration of the casting basin, property owners Boston Wharf Co. and P&G Gillette were required to secure respective "amnesty licenses" to bring the casting basin property and other tidelands parcels into strict compliance with state Chapter 91 waterways regulations regarding tideland parcels. The construction of the dock, which formerly had been considered in CA/T Project meetings as a component of C09D2 Fort Point Channel Surface Restoration obligations, was now required of P&G Gillette in order to fulfill public amenity obligations under the amnesty license being drafted. MassDEP was responsible for reviewing, granting and enforcing this amnesty license, and its decision would ultimately determine the fate of the dock. In May of 2003, DEP and Gillette signed the final draft of the amnesty license. The Gillette Company and Boston Wharf Co. agreed to respective provisions of "Amnesty License 9342a and 9342b" for area improvements, a number of which were required on a tight schedule upon the capping of the casting basin parcel. Among the provisions of Gillette P&G's amnesty license, MassDEP required completion of the public dock. CA/T Project's area developments moved forward rapidly. By the end of 2003, bids were solicited and McCourt Construction was awarded the CO9D2 restoration contract estimated at $12.5 million. Costs for capping the casting basin and providing a number of improvements at the site of the dock were covered by the CA/T Project. CA/T Project involvement included a complex series of negotiations and land swaps. Among these swaps was an exchange of rights to Binford Street Extension (formerly planned to exist as a private street) and Mount Washington Ave (formerly planned to exist as a public way). Ultimately, because Fort Point Pier was a public component of an amnesty license, no encumbrance could be imposed on its public access and use. Editor's Note: The complex negotiations and land swaps related to CA/T Project Fort Point restoration were not made publicly available, so we do not have sufficient information to determine how Fort Point property owners were compensated in exchange for fulfillment of CA/T's mitigation obligations, particularly the reported $12.5 million in funding for CA/T Project CO9D2 contracts resulting in a multitude of public amenities in the Fort Point neighborhood. 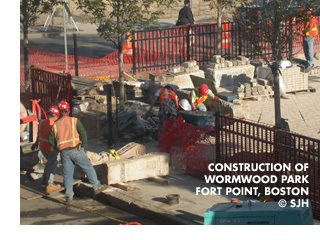 The public process presented by the CA/T Project for Fort Point mitigation and surface restoration resulted in the creation of a number of parks and civic spaces in the Fort Point district including Wormwood Park (shown at right), Binford Street Park and 5070 linear feet of the Fort Point Channel Harborwalk. A greenspace near Vent Building #1 and Cabot Cove, suitably named by the CA/T Project as Rolling Lift Bridge Park, contained a preserved portion of the former "Old Colony" Scherzer rolling lift bridge. Many of these spaces are exemplary of the best civic spaces in Boston, enjoyed and embraced by the Fort Point community. In 2009, a section of the seawall, running from a few yards north of the site of Fort Point Pier to Seaport Boulevard, was included within the bounds of the Fort Point Channel Landmark District (FPCLD) as designated by the Boston Landmarks Commission. The designation, petitioned in 2001 by residents of Fort Point and advocated with the support of the Boston Preservation Alliance, eventually garnered the support of all large property owners. Creation of the Fort Point Channel Landmark District was another significant achievement in establishing long-term recognition of the historic district and a section of its seawall. Movement on construction of amenities required of the land owner under the 2003 amnesty license including the dock and pier was stalled from 2003 and 2009. In 2009, MassDEP renewed its focus its on enforcing provisions of the amnesty licenses and pressed for completion of the dock and pier. In 2010, the Massachusetts state legislature passed Chapter 204: AN ACT AUTHORIZING CERTAIN DEVELOPMENT IN THE FORT POINT CHANNEL IN THE CITY OF BOSTON, which modified the Fort Point Channel harborline to allow for the construction of publicly accessible pier-supported docks and other floating structures envisioned under the City of Boston's Fort Point Channel Watersheet Activation Plan. Streamlining approvals for construction of public amenities on tidelands, this legislation enabled construction of Fort Point Pier to proceed. In preparation for construction of the pier and dock, a fifty-foot section of the Fort Point Channel seawall, just south of Necco Court, was restored by P&G Gillette. Editor's note: With the restoration of the seawall at Fort Point Pier, this small section of granite stones was raised to match the high quality of the seawall further south along the Channel. The deteriorating seawall on either side of Fort Point Pier remains a challenge for property owners and future projects. 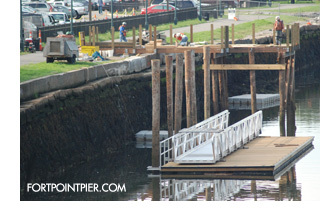 Site preparation, pile driving and construction of Fort Point Pier began in March 2011. Construction was completed in early October 2011. Ownership and maintenance of Fort Point Pier remains the responsibility of the landowner, currently P&G/Gillette, as part of its amnesty license for the former casting basin parcel and other tidelands properties. By contrast with other docks in the Fort Point Channel constructed prior to its existence, Fort Point Pier provides an outstanding level of public access by paddlers. While the City of Boston's "Watersheet Activation Plan" highlighted the importance of public access, past permitting for Boston's piers and docks has predominately served a private abutter with commercial uses best suited to that property owner. In this regard, public access provisions available on Boston's other docks and piers A) restrict access hours and length of tie-up time; and B) have docks of height poorly-suited for entry or exit from a kayak; C) require advance notice for touch-and-go activity; D) limit access to commercial patrons of the abutting establishment; and E) limit public access for exclusive pickup/drop-off by commercial water taxi. Editor's Note: As an aid to paddlers interested in exploring waypoints along the coastline, in the year ahead we will be publishing a chart of public access, public amenities, regulations and restrictions for each of the downtown Boston docks, piers and wharves including Atlantic Wharf (Russia Wharf), Independence Wharf, Fort Point Landing at the Barking Crab, Federal Courthouse, Fan Pier, Rowes Wharf, Long Wharf and beyond. The Channel and the Fort Point District itself has been subject to pressures of territorial and/or private control. With each passing decade, efforts have been made to blur the borders of the Fort Point District even beyond its seawall; to exclude parcels from Fort Point District boundaries; to segment the district bounds into subdistricts; and to promote the renaming and rebranding of the historic Fort Point District. Wikipedia's tortured entry erroneously identifies Fort Point as a district that exists on both sides of Fort Point Channel and both sides of the Boston Convention and Exhibition Center (BCEC). Recognizing the wharf district's prominent history, residents and property owners along with the Boston Preservation Alliance, the Boston Landmarks Commission and other advocacy organizations have meticulously recorded the boundaries, landmark features, character, architectural integrity, land use history and its well-established name, Fort Point. As most faithfully established, the Fort Point District is bounded by the Fort Point Channel seawall on the west; Boston Wharf Road and the South Boston Bypass Road on the east; Seaport Boulevard at the north; and West Second Street at the south. These bounds approximate those of the official Fort Point Channel Landmark District (FPCLD) which itself was the subject of petition and study from 2001-2008 and designated in 2009 by the Boston Landmark Commission (BLC). The BLC designation intentionally excludes the P&G/Gillette main facility, an empty tract south of Iron Street, and empty parcels abutting the South Boston Bypass Road from FPCLD boundaries to exempt those parcels from the BLC's regulatory oversight. As deeded, the current owner of land at Fort Point Pier retains ownership of the dock and pier. Deed restrictions require the dock and pier to be maintained as a public amenity in perpetuity, along with the seawall and Harborwalk. As of 2012, P&G Gillette is the owner and steward of the dock and pier, and the surface parking lot abutting the pier, having purchased this parcel from the Boston Wharf Company in 2000. P&G Gillette uses the name "P&G Gillette Public Dock" on signage and licensing. While the dock and pier at Fort Point Pier were required as a result of public process and historic Massachusetts laws regarding the use of tidelands, property owner P&G Gillette exceeded its obligations under the amnesty license. With sturdy pilings, South American imported hardwood braces, pressure-treated pier and floating dock, Fort Point Pier is built to last. Fort Point Pier opened quietly on a cool, bright fall morning, Friday October 21, 2011. At 9 AM, we rolled a kayak onto the pier, down the gangway and launched it off the dock into the Fort Point Channel. The christening of Fort Point Pier was worth the wait. UPDATE: With the 2016 sale of 2.5 acres of land by P&G Gillette to General Electric, Fort Point Pier and its floating dock are property of GE, no longer P&G Gillette. All encumbrances of the deed including existing public access provisions under the state's Chapter 91 amnesty license transfer to General Electric. Special thanks to Ron Killian, Mgr. of Environmental Permits & Procedures at MassDOT for his generous assistance in research regarding the CA/Tunnel casting basin. Editor's Note: The history above is based on a best attempt to compile information from available public records and recall of the public process including visioning and design meetings held by the CA/T Project in Fort Point regarding the construction of Fort Point Pier. Public officials and advocacy organizations regularly present at CA/T Project Fort Point Channel (CO9D2) meetings during this period included F. Yalouris (CA/T Project), R. Brazile (CA/T Project), R. Killian (CA/T Project), J. Hart (Community Liasion, CA/T Project), R. O'Shea (Community Liasion, CA/T Project); and B. Lynch (MassDEP); and South Boston elected officials (as Senator) Rep. Stephen F. Lynch and Boston City Council Pres. James Kelly; and V. Li (Boston Harbor Association). From the perspective of participants in the public process, the dock was first conceived as a component of surface restoration and mitigation to be fulfilled upon capping the tunnel section. 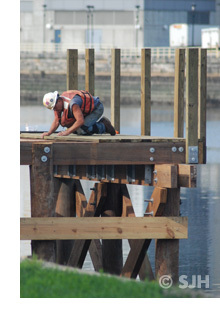 At some point in early 2003, the obligation for construction of the dock became a component of the amnesty license required for the casting basin to come into compliance with state waterways regulations. Negotiations regarding the details of the provisions of the amnesty license resulting in the requirement for construction of the dock were not a component of public process. To members of the public attending CA/T Project meetings, the amnesty license would encapsulate obligations of CA/T Project on tidelands parcels and would require the landowner(s) to bring parcels in compliance with waterways regulations. It is impossible for us to be fully capable of understanding the relationship between the CA/T Project and each public agency and private property owners involved in the completion of the CO9D2 Fort Point Surface Restoration projects — in this instance the pier and dock. In the microcosm of public process as we can recount it, the Fort Point community participated in a multi-year series of monthly public CA/T Project CO9D2 Fort Point Surface Restoration meetings during which the dock was conceived and discussed, and we filed comment letters to MassDEP in support of the requirement for a dock and pier. During the same period, the community participated in the year-long process of drafting of the Boston Redevelopment Authority's Fort Point Channel Watersheet Activation Plan (FPC-WAP), which conceptualized a dock and reinforced general support for a series of docks in the Fort Point Channel. As this exploration suggests, the completion of the CA/T Project and ancillary restoration projects was a Herculean task. Few visitors to Fort Point Pier in generations ahead will know its history. But for those interested, we have provided insight and appreciation to this and other extraordinary accomplishments of Boston's "Big Dig" and also to amenities created through compliance with state tidelands regulations.Questions, corrections or comments? Contact us here.© 2011 All rights reserved.